Faction frigates come in two varieties - navy faction frigates (belonging to amarr, caldari, etc) and pirate faction frigates (belonging to angel cartel, guristas, etc). Unlike the navy cruisers and battleships, the navy frigates are all unique ships rather than simply souped up versions of t1 hulls. Their abilities generally fall somewhere between assault frigs and interceptors - they tend to be faster than the former, but gankier and tankier than the latter. The firetail is best described as a lighter, faster jaguar. The slot layout is effectively the same (the firetail actually gets 3/4/3 with 2 turrets, but a 20% per level turret bonus rather than the jaguar's 10% - a holdover from when this ship had a mix of turrets and launchers, and ccp didn't want to add further turret hardpoints when they rebalanced it). Common fits for the firetail are also very similar to the jag, with a medium shield extender as standard and either prop/scram/web or dual prop & scram being the most common combinations. As with the jag an armour tank is possible, and this can potentially be flown as a 'super rifter', although this is less common. The firetail's damage output is reasonable, but nothing to write home about. The ship's cpu and powergrid are quite limited, making most common fits very tight in comparison to the equivalent jag fitting. This ship can field quite a solid shield tank, but again not to the levels of the jaguar. Where it does come through however is on speed (where it's capable of 3.5-4.5km/s with a mwd, on par with some of the combat interceptors) and in the presence of the ever-useful tracking bonus that AFs like the jaguar lack. The firetail's speed makes it adept at chasing down fast targets and at dictating range in a solo engagement. It also makes the firetail a very effective ship in gang when filling a 'chaser tackle' role. Like the claw, the firetail receives no turret range bonus, and because of this (and its tracking bonus) you're usually better off holding it at range where possible, assuming your weapon system (and speed) gives you the option. It can still hit out quite far with barrage, but real dps will reduce quite a bit as range increases. Since firetails are usually shield tanked, em or thermal damage is recommended. Firetails have a spare high slot, which may fit a nos or neut if they have the fitting room - beware of this is you rely on an active tank. I mentioned the slicer previously in my discussion of the crusader. These two ships are similar in a lot of ways, including looks! Slot layout is similar, with the slicer receiving an extra low for a 3/2/5 layout (like the firetail, it receives a large turret bonus to bring damage in line - 25% per level in this case). What makes the slicer interesting is its optimal range bonus; pulse lasers already have very good optimal range for a close ranged weapon system thanks to the wonder that is scorch crystals, and on the slicer this only gets better. An unmodified slicer can already hit out to about 15km at optimal, and with a few rigs or tracking enhancers that can be pushed out to over 20km! This excellent range gives rise to the most common slicer variant - the kiting slicer. These will typically be mwd fit, with beefed up optimal range (about 20km give or take) and a good damage output. The rest of the fit may vary, from pure speed (on the basis that their best chance of survival is in not getting caught in the first place) from moderately tanky (which while reducing kiting ability, gives the ship the ability to see off many of the ships which could potentially tackle it. Unlike the crusader, the slicer will be receiving the full signature radius bloom from running a mwd, so larger ships may simply be able to pick them off as they try to kite. Some pilots choose to fly the slicer as a brawler, with the 5th low allowing for additional tank or gank compared to the crusader. While you're not going to see anything like the tank of the amarr assault frigs, a fairly moderate active tank (or mix of active and buffer) is possible. The slicer also has a free high slot which it can potentially use for a nos to keep that tank going - due to a weak powergrid, this is uncommon on kiting setups due to the need for a mwd and higher calibre weapons. A mwd slicer will naturally do between 3 and 4km/s, and with overheat it can push that up to nearly 6km/s. Unless you can handily outrun that speed, I recommend not chasing a mwd slicer directly - try to get them close to you instead, either through manual piloting or by having them chase you in warp. The dps output of the slicer is quite surprising even with scorch, and by chasing from 20km you're handing them a significant advantage - even if you're able to close the distance the chances are you'll have taken significant damage by the time you've done so. At close range the slicer puts out a lot of damage, and thanks to its choice of weapon system it can switch between scorch and multifrequency without needing to wait and reload. Even if you're able to catch a kiting slicer, the fight is by no means over. Brawling slicers tend to do slightly less damage due to using their low slots for tank, but you can still expect quite a tough fight. Since the slicer can only deal em damage (with some thermal), an armour tanked ship or minmatar t2 will generally perform well against it - t1 shield tankers should probably avoid this fight unless you're feeling confident. If the slicer is tanked it will generally be in armour, so explosive or kinetic damage is a good choice. Remember that the slicer doesn't receive a tracking bonus in close, and the high calibre turrets of a kiting slicer may be avoidable at close range - convenient given that the slicer often fits a mwd and long point and can't field a web, generally giving you the advantage in range control if you're able to scram it. The slicer is also reliant on cap for both weapons and tank (if it has one), and combined with an mwd and long point this can make the slicer a very cap-intensive ship to fly. If you have a neut, it may server you well in this fight - particuarly if the slicer has already burnt cap mwding around. That said, most fights involving a slicer are over before a single small neut would have begin to make an impact. If the firetail is like a jag and the slicer is like a crusader, then the comet is definitely like a taranis. Again, the slot layout provides the comet with an additional low compared to its counterpart with 3/3/4 (and two turrets with a 20% per level bonus). The comet also sees a receives a tracking bonus and is able to field 3 light drones, with room in its drone bay for an additional flight. The extra drone combined with an additional low slot for a potential damage mod give the comet even more dps with blasters than the already ganky taranis - the best output of the navy frigates by some margin. It also has more cap recharge and more hp than the ranis does (although its structure is weaker, the comet gets additional shield and armour hp). Where the comet loses out is in speed, although this could potentially be remedied by using one of its additional low slots for a speed mod. The comet also doesn't receive the inty's mwd sig radius bonus, making it less suited than the ranis to a chaser tackle role. Fighting a comet is much like fighting a ranis - if you're able to keep range (either because it has an ab and you can fight outside web range, or because it has an mwd and you have a scram) then you should be able to avoid its dps other than from the drones (which remember there are two flights of, so shooting them first is probably not worth it). If you're unable to keep it at range, you'd better just hope that you have enough tank and enough tracking to beat it in the dps war - no small feat by any means. If you encounter a rail comet, obviously try to get in close under its tracking, and remember it will still probably put out more dps than most close range frigates. Since most comets are armour tanked, explosive damage is generally preferable (as gallente, t1 kinetic and thermal resists are actually identical). The ship that the hookbill is most comparable to is the hawk (or, as funny as it might sound, the buzzard). Like the hawk the hookbill is a missile ship, with a bonus to missile range. It has a 3/5/2 slot layout with 3 launchers (and a 20% per level bonus to each, meaning that like the hawk the hookbill receives a higher 'effective number' of weapons than the other ships in its class). What makes the hookbill really shine however is those 5 mid slots. Remember during my discussion of covert ops ships, I mentioned that the incredible range control afforded by 5 mid slots make the helios and buzzard viable combat ships? The hookbill is the only dedicated combat ship which has that many mid slots; while one is usually taken up by a shield extender, this still allows the hookbill to field an ab/scram/double web combo, giving it one of the best range-dictation capabilities in the game. This is especially useful considering that the hookbill generally fits rockets (fitting standards alongside a tank is pretty much impossible due to powergrid), and rockets benefit greatly from having a stationary target. While the on-paper dps of the hookbill is still low, missiles are always deceiptive in that regard - when dual webbed it will probably be dealing close to its maximum damage very consistently, and it can do so anywhere out to 15km. The hookbill is known to be one of the few ships which can consistently kill a dramiel without it simply being able to burn away, and against any blaster ship (other than potentially the daredevil) a dual web hookbill is likely to walk through the fight with relative ease. It's worth mentioning of course that not all hookbills opt for the dual web combo, although due to the prevalence of dramiels at the moment it tends to be very popular. Some pilots may choose to further enhance their tank (which is fairly moderate by the way - similar to that of the firetail) or to fit other ewar like a tracking disruptor. When fighting a hookbill, having fairly flexible range yourself will be a big help given that they will likely be controlling the engagement. EM or thermal damage tend to be the best choices (em is naturally the lowest resist but is often plugged with a rig, while thermal rarely is). Even with an rig covering the hole, em remains a better choice of damage type than kinetic or explosive. Pirate frigates, as their name suggests, belong to the various npc pirate factions of eve. These tend to be much more exotic than their navy cousins, eitherdue to unique bonuses or novel combinations not available with other ships. 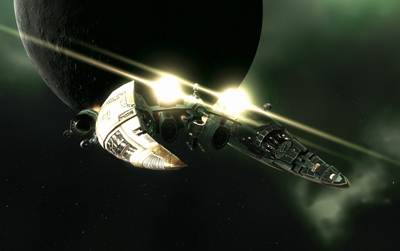 Pirate faction ships require two racial ship skills rather than the regular one, and often incorporate elements of the two races in their design (for example the cruor requires amarr and minmatar skills, and gets bonuses to neutralisers and webs - the secondary ewar types of amarr and minmatar recon ships respectively). When it comes to speed, the dramiel is king - beating the combat inties on both speed and agility by a small margin. Typical speeds for a dramiel range between 4 and 5km/s, usually near the upper end of that scale. However, the dramiel isn't simply fast - it's also a very capable combat ship. With a 3/4/3 slot layout and 2 turrets (with a fixed 100% turret damage bonus, effectively the same as the 20% per level bonus on the firetail) and 3 light drones for good measure, the dram puts out as much dps as some of the gankier assault frigates. It also receives bonuses to tracking and falloff, allowing it to apply that damage very flexibly. Finally the dram has the same excellent mid slot layout as the jag and firetail, allowing dual propulsion with a medium shield extender (by far the most popular fit for a dram) or other combinations as suits the occasion. In other words, the dram outperforms the firetail in every way (except for price of course)! Thanks to its combination of speed and combat prowess, the dram is a very versatile ship. There are other ships which can do more dps and which have more tank, but the dram is unusual in that with a single fit it can compete with numerous specialised ships in their own areas - it can be as fast as an interceptor while still having a combined gank/tank of an assault ship or other faction frigate. Add to this the fact that the dramiel is fast enough to escape almost any engagement (even when scrammed, a dram do over 2km/s with an overheated t2 afterburner), and you can see why it's a popular ship for PVP. Despite this, killing a dramiel is easier than you'd think. First of all, because most drams fit dual prop they have comparatively poor range dictation compared to an ab/scram/web ship (most drams simply rely on overheating their afterburner to pull range when required, and it often works). Also, due to their ability to disengage relatively easily, dram pilots tend to be fairly gung-ho and will nibble at targets that they potentially shouldn't. Finally, due to the dram's high mwd speed many dram pilots have difficult controlling the range they start the engagement at, with an initial overshoot being very common. The best ships for killing drams are those with two webs (or with a web bonus such as the daredevil). The reason for this is that it removes the dram's ability to disengage, and at that point it's just one combat frigate vs another - a relatively level playing field. Aside from hookbills and helioses, cruisers are also very effective for this kind of combat - caracals and celestises have both proved very successful dram-slayers due to their underrated nature and abundance of mid slots. Some fast scram/web ships such as the taranis or comet are also capable of holding a dramiel with some good piloting. Even if your ship of choice isn't able to prevent the dram from disengaging entirely, many dram pilots will underestimate the time it will take the time it will take them to get out when things start going wrong. Especially if you can keep them interested (for example by repping less than you're actually capable of, within reason) you may find a dram pilot sticks it out until the bitter end. Flying a ship with flexible range (to continue shooting the dram as it burns out of web range) will help you considerably when attempting to take out a disengaging dramiel, as will having a scram and/or web in the first place. As with most shield tankers, em or thermal damage are the preferred choices. While drams can choose damage type, their drones will almost always deal explosive (since warrior IIs are the only drones which can easily catch up to a MWDing dram if it decides to disengage). Thanks to falloff and tracking bonuses, there is no ideal range to fight the dram - simply opt for the one which will maximise your own damage output and if necessary minimise the chances of the dram escaping. When the dram is able to disengage, aim to start dealing damage as early as possible and as quickly as possible - as I mentioned the dram will often overshoot initially, meaning low angular velocity and a delay before they're properly able to assess your damage output and react to it. You may even be able to catch the dram pilot off guard and tip the balance such that by the time they realise they need to disengage, it's too late to do so. The daredevil is effectively a navy comet with one important difference - a 10% bonus to the velocity reduction of webs per level. This means that a single meta 4 web on a daredevil will reduce its opponent's speed by 90%! Like the comet, the daredevil gets 3/3/4 slot layout with 2 turrets. It doesn't get any drones or a tracking bonus (although with a 90% web, tracking is no real concern), however the turret bonus is a fixed 200% (for 6 effective turrets, compared to the comet's 4). This leaves the daredevil with better damage output than the comet, and additionally all of its damage output can be overheated - something which can't be said for drones. The weakness of the daredevil lies in its tank - or lack thereof. As with the comet and taranis, a light active tank combined with a natural structure buffer is the most common option (sometimes supported by a nos in the spare high slot) and a buffer tank is quite difficult to fit effectively. While a lot of daredevil pilots fit mwds (after all, who needs the range control of an afterburner when you've got a 90% web?) they're typically almost impossible to control range against short of jamming them. Even if you're able to do so, a falloff bonus means that they're actually fairly flexible even with blasters. As with the dramiel, your best bet is to simply have a stronger combination of gank and tank than the daredevil does, and to do what you can to prevent it from escaping once the fight turns your way (a process which thankfully should take longer than it does for the dram). As with some of the other 3 mid slot hybrid boats, a rail daredevil can also be effective. Due to the massive damage bonus it receives, you can expect incoming damage still comparable to (if not higher than) that which the other faction frigs but out with close range weapon systems, and with a 90% web the daredevil can handily hold you at whatever range it chooses. Since it only has 3 mid slots the rail daredevil isn't able to reduce your own range in the same way as ships like the helios can, so another ship with comparable range may be able to nullify this advantage. Of course thanks to the daredevil's strong damage output you'll probably find that even that will be an uphill struggle, and without a stiff tank you're unlikely to succeed. As with the comet, explosive is generally the damage type of choice (even if filled by a rig, it's barely higher than thermal and kinetic). The worm is a strange cross between the hawk and the ishkur. It takes a similar slot layout to the hawk (3/4/3 with 2 launchers) along with the hawk's missile range bonus and combines it with the drone capabilities of the ishkur, with 5 light drones and room in the bay for a second flight. In exchange the worm's 2 launchers receive no damage bonus, meaning they really are just 2 launchers. Finally, the worm receives a shield resist bonus putting it on par with most assault frigates in terms of tank. The combined damage output of the worm's drones and missiles is fairly low for a faction frigate - the missiles contribute very little without a damage bonus. The flexibility of the drones however allows the worm to apply damage from whatever range it wishes, and this convenience is worth quite a lot. In general, the worm should be an easier opponent than the ishkur. The tank is comparable (although likely to be more buffer than active), but its damage output is considerably lower. Thanks to its resist bonus and the cheapness of shield resist rigs, choice of damage type isn't that important (thermal will probably be lowest after an em rig is added). If in doubt, killing the drones will remove 75% of the worm's damage output - assumig you can chew through two flights of drones before they chew through you of course! The succubus is probably the least surprising of the pirate frigates (at least in the sense that it doesn't receive a unique bonus or have any aspect in which it's particiularly unusual), other than of course its combination of weapon system and tank. As an amarr-caldari hybrid, the succubus is both a shield tanker and a laser boat. The other interesting aspect of the sansha line is their tendency to have plenty of spare high slots (and no launcher hardpoints), making them useful both for PvE and for cap warfare. In terms of comparison, the succubus most closely resembles the harpy. With a 4/4/2 slot layout and 2 turrets (receiving both a fixed 100% damage bonus and a 5% per level bonus too) the succubus puts out fairly nice dps at respectable ranges. A shield tank is the obvious choice, and due to the cap consumption of its weapon system a buffer tank is generally preferable to an active one (although if fitting nos, an active tank can be an effective choice too). The two spare high slots give the succubus excellent cap warfare abilities, either supporting its own cap useage (useful as tackle in a gang where neuts are present) or to kill off active tanks on its opponent. The succubus receives a tracking bonus, and with an optimal range on pulses of about 10km with scorch, there isn't really a range at which it can't hit effectively (other than, obviously, outside of web range). The succubus has tank and gang on par with an assault frigate but not superceding them, and an equally tanky/ganky ship should have a reasonably chance of beating it. As with the other shield tankers mentioned above, em and thermal (if anti-em rigged) are the best damage types to employ against it. The cruor shares a number of similarities with the daredevil - it has the same web strength bonus, a similar slot layout (4/3/3 instead of 3/3/4) and 2 turrets. Where the daredevil gets a fixed 200% damage bonus however, the cruor only gets a 100% bonus, resulting in fairly mediocre dps for a faction frigate. What it does have however is much more flexible range, thanks to pulse lasers and scorch - this lets the cruor take advantage of its range-dictation abilities in a way that the daredevil cannot. It also receives a bonus to neut transfer amount (note that it is only transfer amount, not range like the sentinel or curse) - combined with 2 spare high slots, this makes the cruor excellent for cap-warfare. Fitting a web on the cruor is pretty much manditory due to the effectiveness of its bonus, and that means the cruor will almost always be armour tanked. This ship is actually quite generous in terms of powergrid, so a light to moderate buffer or combined buffer and rep fits quite easily. As a primarily amarr-based ship, the cruor is fairly sluggish compared to the daredevil. Providing you're able to remain outside of web range, you'll probably find evading or controlling range against the cruor to be fairly easy, especially if it's afterburner fit. Given the range of its webs and neuts, cruors are likely to be set up for fairly close range; that said, kiting cruors with optimals of up to around 15km are not un-heard-of. While the range of the cruor's neuts/nos is only about 6km, the strength bonus makes them particularly dangerous. If the cruor is able to web you, expect to be neuted in short order. Not only will this quickly turn off any active tank, but if you don't have a nos or cap booster of your own you may find guns and tackle turning off too! Capless weapons (i.e. projectiles, drones, or missiles) will prove invaluable when fighting a cruor, as will some method of replenishing your cap, however slight. Due to the fairly average tank and gank of the cruor, a strong combat ship with capless weapons will probably succeed in driving it off (although since your tackle will likely be disabled once you cap out, actually killing the cruor may remain elusive). Well timed nos cycles to keep tackle running will make a big difference. Explosive and kinetic damage are generally most effective (which is convenient since capless weapons most often use these damage types). Remember that the cruor is very cap-dependent itself, especially if active tanked. While you will almost definitely cap out before it will, in a prolonged fight you may find the cruor's neuting power is reduced (or with poor piloting, it may cap itself out completely). On this note, a well timed burst of medium neut from a cruiser has the potential to really tip the fight in your favour. Some pilots choose to fly the slicer as a brawler, with the 5th mid allowing for additional tank or gank. Btw great series, keep it up! Also, " It's worth mentioning of course that not all hookbills ops for the dual web combo," I'm guessing that was meant to be opt, not ops :) Just a minor spellcheck, awesome article though! I LOVE these posts. As an amateur FC this is invaluable reading. A heads up, all the other "know your enemy" posts have had the icons of the ships, however this post seems to be missing them. Should be noted that Faction Frigs receive less Rigging room(can't fit a damage and RoF rig together).